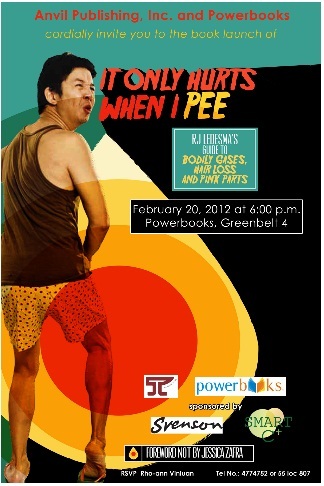 RJ Ledesma has launched his fourth book " IT ONLY HURTS WHEN I PEE, RJ Ledesma’s guide to Bodily Gases, Pink Parts and Hair Loss" last February 20 (Monday) 6pm @ Powerbooks, Greenbelt 4, Makati City, Philippines. 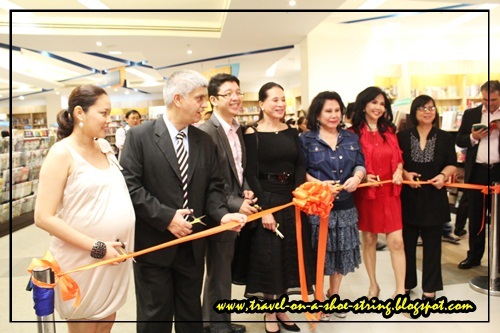 RJ Ledesma is a three-time best-selling author and 30th National Book Awards finalist, an entrepreneur, multimedia practitioner, yogi and author of Lies My Yaya Should Have Told Me (2008), I Do or I Die (2009), and Is It Hot In Here Or Is It Me? (2010). His fourth book “It Only Hurts When I Pee, RJ Ledesma’s Guide on Bodily Gases, Hair Loss and Pink Parts.” distributed by Anvil Publishing, is a compilation of the ridiculously truthful, self-aware and highly comical chronicles of the less hygienic male species based on curious epic research, thorough investigation and, ahem, first-hand experience. From the freshly squeezed brain juices of RJ Ledesma, the book and all its 167 pages tackles amusing topics and antics, including classic and epic details in the Pinoy dating and mating scenes, and male entertainment created simply by grimy fingers and a lack of good taste. Wonder why bad guys often become the object of romance by women who, in RJ’s own word, desire “to increase the country’s current voting population”? Let the entrepreneur, multimedia practitioner, yogi and author of Lies My Yaya Should Have Told Me (2008), I Do or I Die (2009), and Is It Hot In Here Or Is It Me? (2010) tickle your funny bone and usher you into testosterone land with his newest masterpiece guaranteed to make you pee to your heart’s content. GLOBE Free Facebook promo until March 14 2012.